Pinch is a hoarding packrat who initially refuses to give up any of his stuff for the town’s tag sale. His house was overflowing onto the street with “piles of magazines and old clothes” and toys and other items. His friends try to convince him that he’s run out of room in his house and other people can reuse his stuff, but as anyone who has ever seen or heard of the hoarder shows on television knows, it’s not so easy for a hoarder to give up his stuff. “‘Noooooooo,’ wailed Pinch. ‘I like all my stuff…’” So his friends “shook their heads and … picked up trash and gathered newspapers, cans and bottles for recycling” and then went to join the town for the tag sale. As Pinch observes the town participating in the tag sale, he reconsiders selling some of his stuff so he can make money to buy more stuff. He loads up his wheelbarrow several times full of his belongings (I had a tough time believing the ease at which he parts with his stuff) and as he sells them, he realizes that he never noticed the qualities that his buyers noticed about the items because they just lay at the back of a closet. He manages to sell everything and his friend suggests they use the money to buy trees to beautify the town. Pinch says he’ll consider it and goes home to enjoy the clean rooms in his uncluttered house. Although I like the message about getting rid of stuff that we don’t use or need, I struggled with the fantasy that it’s so easy to part with the clutter that fills up our own homes. And that’s not even touching on the deeper psychological issues of anxiety, depression, or obsessive compulsiveness linked to acquiring and compulsive hoarding. Understandably this is a children’s fiction story which highlights the altruistic reasons for giving up extra toys and clothes. However, it barely touches on the concern of materialism in our commercial society, how to deal with limiting what we purchase, and never mentions happiness in terms of experiences versus posessions. If we reduce the amount we purchase, there would be less stuff we need to deal with or get rid of. 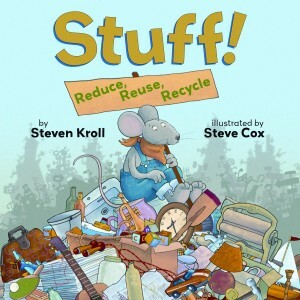 I also felt some of the title was misleading because recycling was given a bit role in the story and nothing was mentioned about reducing the amount of trash and toxicity we buy/create. The issue of hoarding/discarding “stuff” was primary but there was no information about the support that enables a person to deal with hoarding issues. The book was entertaining and may be a good introduction to topics that parents should follow up with further. My daughter enjoyed the detailed and colorful illustrations depicting the overfull house at the beginning, selling toys at the tag sale, as well as the animal townsfolk but it did not motivate her to donate or sell any of her own abundance of toys. Nor did it increase her interest in recycling.